Water � For the size of fat batch that you are using, we recommend that you use approximately 6 fluid ounces of liquid. Warning: Always add your solid form lye, sodium hydroxide or potassium hydroxide, to the liquid. If the liquid were added to the solid form lye a violent reaction could result. This means you could have a �volcano� erupt out of your container. 5% to 8% excess fat range: This is the range most often used. DISCLAIMER: Every effort has been made to ensure that the information contained here is accurate. However due to differing conditions, tools, and individual skills we cannot guarantee the information is applicable in your situation. We are not responsible for any injuries, losses, or other damages that may result from the use of this information available here. A Material Safety Data Sheet (MSDS) can be found at The Nanaimo Soap Exchange. -While wearing safety goggles and neoprene gloves, combine solid lye and liquid - stir well. Set aside to cool (100-125 Degrees F.) This is best done outside while standing upwind. -Combine oils and heat gently. Once the fats and oils are melted allow the temperature to drop to 100-125 Degrees F.
-Pour raw soap into your prepared molds. After a few days the soap can be turned out of the mold. If the soap is very soft, allow it to cure for a few days to firm the outside. 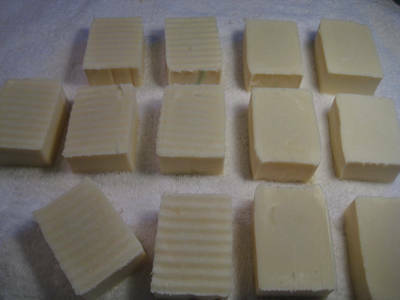 -Cut soap into bars and set the bars out to cure and dry. This will allow the bar to firm and finish saponification. Place the bars on something that will allow them to breathe.